The Hardy Life: "The Babymoon"
For anyone over the age of 30 reading this, I'm sure you've never heard of such a thing as a "babymoon." As my parents said, "We just worked our butts off till the baby came." But there's a recent trend in couples taking a final getaway together before the baby shows up to spend some time reconnecting since life is about to change dramatically. Robert and I didn't exchange gifts for Christmas this year, and instead planned on taking one last trip over Christmas break. After we found out about Clara's complications, we decided to scale back the trip a little. Even though the chances of something going wrong at 27 weeks are slim, we did not want to be delivering this baby on a cruise ship or in a remote village in Costa Rica. Plus, we're saving our money for the impending medical bills. 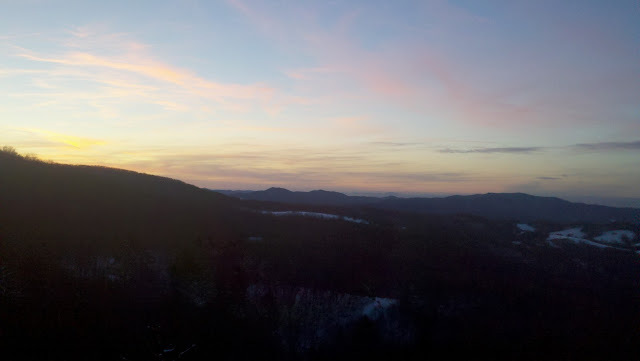 So, instead we have spent a couple of nights at Beech Mountain relaxing and sleeping and relaxing and eating and relaxing. It's been wonderful. 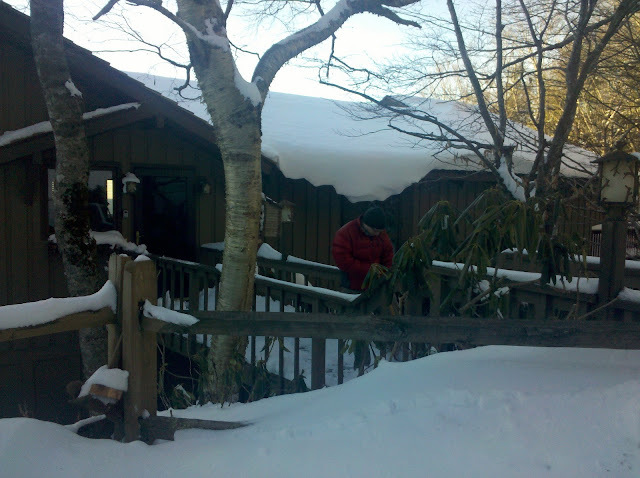 When we first arrived, Beech Mountain had recently gotten over two feet of snow. I stayed in the warm car while Robert shoveled the walkway. He's a knight in shining armor, really. And the lovely views of sunsets by evening. The views are best enjoyed from inside though, preferably in front of a roaring fire. The fire is even better if it has the world's most adorable puppy snuggled up in front of it. We enjoyed breakfast at the Pancake House. Fortunately, they were able to get us in the next day and ahhhhhhhhhhhh.... bliss. We also enjoyed a delicious dinner out at a Banner Elk restaurant. Robert's very rare steak looked mouth-watering (of course, no bites for me. Thanks, Clara) and I enjoyed some yummy fish. It was nice to have a nice night out. But most of our time has been spent just enjoying each other's company and the warmth of snuggles. And no, I'm not drinking wine. It's orange juice and gingerale. It's nice to pretend though. So, Monday we both return to work and reality. We've got two and a half months or so to go and lots of preparations still to make. For now, it was nice to just spend some time away from everything and enjoy loving each other. Thanks for a good excuse, Clara. Great pictures. Love that you are having some fun as two before it becomes more difficult to get away. We didn't know the term "babymoon", but Brian and I went to Disney and Universal on an impromptu trip (planned 6 hours or so before we left!) 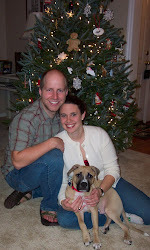 in the months before Morgan came home. We took advantage of a conference Brian needed to attend in Clearwater Beach, FL, before Brennan was born. It's a great tradition! What a lovely testimony to your love for one another and Clara. Clara is most blessed to be born into your home...you will love her superbly!!! A Happy New Year to you!!! Looking ahead to the joyous birth of Clara in 2011... March will be here before we know it!